My life has been full of mentors and I have mentored, too, but in the interests of keeping to 500 words, I‘ll write about someone who can be extolled briefly. The mentor on my mind is someone I never met yet saw frequently nonetheless, a character and caricature of a man who wandered the roads and lanes near Dean’s Grange in County Dublin, someone we’d pass in our green and cream colored double decker bus, someone for whom every kid would press to the windows to catch a glimpse of this local institution something like spotting a leprechaun, though he was, in fact, much bigger and not so crafty. If you don’t know it, let me disabuse you of your lack: the Irish are especially good at nicknames and monikers, and can pinion anyone with a name that lasts for generations (hence, to some I am still called “Jack Adventure,” for my interest in roving and exploration) and in the case of the man in question, the name bestowed on him is a thing of beauty as striking as the Wicklow mountains and a poetic as the soft Irish rains. This man who wandered the streets as I wander this prose had the wonderful name of Johnny Forty Coats. He is my mentor. Johnny Forty Coats was probably homeless, hence the forty coats. 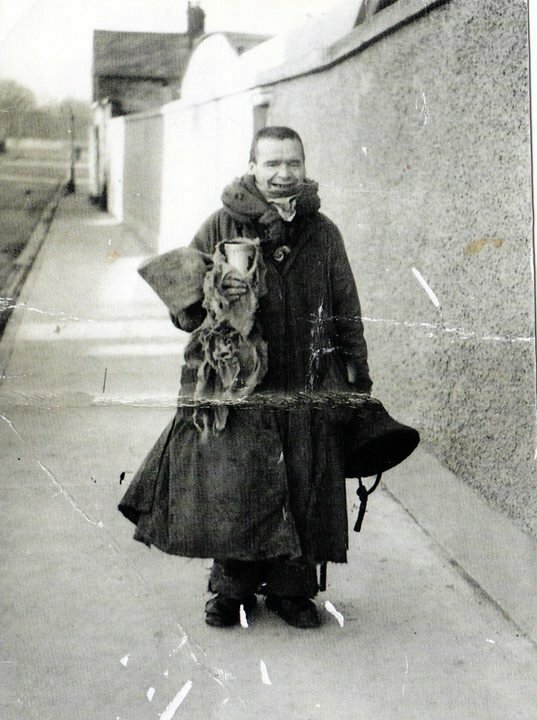 I doubt he really wore forty coats but he wore many, one on top of the other, layered and layered he was from a thin gabardine duster right up to a heavy Irish tweed coat, probably a hand me down from Charles Byrne, Ireland’s tallest man ever—the Irish giant. These coats peeked out in layers and in different places and magnified the wearer into someone much larger. Day after day, he wore them, never altering his appearance one jot. I often wondered if he bathed in his coats and was sure he slept in them. In hindsight, I doubt he bathed at all. As we’d rumble by on the bus cheering, there was a greater sense of love than of derision looking at this downtrodden, middle-aged man with the wild chestnut hair who undoubtedly had some form of mental illness. Our reaction to him was much the same as Harry Potter’s reaction to Hagrid: we loved him, quirks and all. But as we’d drive past Johnny Forty Coats and return to our seats and our games of slamming each other into the sides of the bus or trying to tip the bus by getting everyone to stack up on one side of the top floor until the conductor stomped up the stairs and told us to “sit in our feckin’ seats” or he’d tell the nuns on us, I would think about Johnny Forty Coats and his many layers, his cultivated blank stare. I knew he was lonely and empty, living mainly because he hadn’t worked out an alternative, those coats an obvious metaphor for the distance he kept from others. In the image here, he looks happy and his hair is cut short. In reality, he looked otherwise. And even when we’d roll by, waving and crying out, he’d never look up, never raise his head from the ground to see the goodwill we carried him. Later, when I learned the walk of depression, I was the same, much layered, head down, oblivious to kind advances. Johnny Forty Coats, aka P.J. Marlow. (I hit Post too soon.) That last line killed me. Thanks Laura. It almost killed me too. Johnny Fortycoats — so true. There is often mentoring that goes on where we least expect and stories we pass that often later help us see truth we may have missed otherwise. Thank you for sharing this. How much goodwill do we miss when we walk the walk of depression, never thinking to look up? Oh, I do hope you find yourself in a much better place these days. I always enjoy your writing, Tonia. I suppose in so,e ways, I’ve been like Johnny, too. You are such a wordsmith. Melinda, you’re so nice to say that. I’ve been reading so much I don’t know what I think anymore. Bet you know this one.